John E. Bird was born at home on December 19, 1862, in the village of Clayton, Michigan. He was educated in the public schools and attended nearby Adrian College. After a two-year study of law, he was admitted to the Bar in November 1888, thereafter entering private practice for several years. In 1894, he was elected Prosecuting Attorney of Lenawee County. He was re-elected and served until 1899. In 1905, Bird was elected to the first of three two-year terms as Attorney General for the State of Michigan. During this time “the State of Michigan undertook to deal with the railroad corporations. The Legislature repealed the charter of the Michigan Central Railroad and provided for an ad valorem tax on railroad corporations to replace the tax on income.” The litigation for the state under the direction of Bird was carried to the United States Supreme Court, who declared the ad valorem tax to be valid. As a result, $15,000,000 was paid into the primary school fund of Michigan. 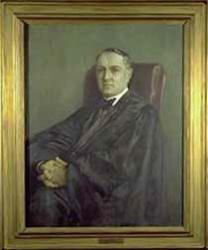 Following the close of Bird’s third term as Attorney General, he was appointed by Governor Fred Warner, in June 1910, to fill a vacancy on the Michigan Supreme Court. He succeeded Charles A. Blair in this office, as he had followed him in the office of Attorney General. The following November, Bird won election to the seat for the remainder of the term, and on April 3, 1911, he was elected to the first of two full terms on the Bench.